I’m not one of those people who are great at finding the perfect gift. Some people have a knack at gift shopping. It’s not a talent of mine. What makes it even harder is when you’re shopping for people that obviously have very specific tastes! Including, of course, people interested in health and wellness. It’s hard to find healthy gift ideas that aren’t cliche or boring. That’s why I made this gift guide! As someone who loves both giving and receiving healthy gifts, I’ve seen a lot of health and wellness presents that are awesome, and some… not so much. 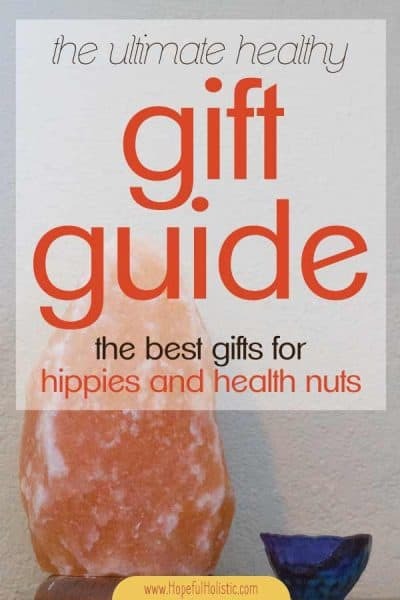 Stop the guesswork and use this guide to help you decide what presents are best for the yogis, nutritionists, athletes, organic food eaters, hippies, and wellness fans in your life! The items I’ve listed below are my picks for the best holistic health gift ideas for 2019. I’ve got gifts for foodies, parents, guys, athletes, and more, everything all-natural and good for you! The healthy people in your life will love receiving these gifts! Of course, if your friends or loved ones are struggling with health issues, chronic illness, or allergies, it’s best to check with them first to make sure you know about their allergies or other health limitations. Some people who are trying to recover or stay healthy naturally have to avoid things that seem completely normal for people without any health issues. If you aren’t sure that they can use what you’re getting them, make sure to include a gift receipt! Without further ado, here are my tops picks for holistic gift ideas for the wellness nut in your life! If you’re shopping for someone who enjoys healthy living, planning, and who wants to make 2019 their healthiest year yet, I’ve got a great option for you! A friend of mine is selling an amazing Healthy Living Planner– it includes weekly and monthly calendars, healthy living checklists, resources, and DIY tips! It’s the perfect gift for anyone who wants to take small, manageable steps to live more healthfully. You can find out more about the planner here. And if you like saving money, use code HOPE10 at checkout to get a 10% discount on your 2019 planner! They cleanse the air and are even reported to help boost your mood and reduce allergies. There are regular salt rock lamps, but if your loved one already has that, there are also pretty cool round salt rock lamps, baskets of salt crystals, pyramid rock lamps (how cool is that? ), and salt rock candle holders! Speaking of candles, I don’t know anyone who’s into health that wouldn’t love getting beeswax candles as a gift. You can buy tea lights (to go with the salt rock candle holders! ), votives, or taper candles. Just make sure they’re 100% beeswax with cotton wicks to ensure that they’re non-toxic! You can also get smudge sticks– anyone even partially crunchy will love these! If you’re buying these for someone who’s never smudged before, there are also some really neat complete smudge kits! Grounding (or earthing) mats are great gifts for people who have (or try to have) healthy lifestyles! Grounding helps you sleep better, can help with chronic pain and arthritis, and can even help with anxiety and depression. This is especially true if you use these in the winter, when you aren’t getting outside quite as much! Learn more about grounding here. You can buy grounding mats (I use this one under my desk every day) but there are also grounding sheets you can buy for a better night’s sleep. And while you’re at it, why not buy them a hypoallergenic and organic pillow? Finally, if you’re feeling creative you can get a handful of the things on this list and make your own healthy gift basket! Just find a nice wicker basket and put your presents in it, and tie some ribbon on top to make it look nice. Easy peasy! If you’re looking for even more gift ideas, check out this eco-friendly gift guide! If you’re looking to buy a gift who someone who loves essential oils, you know they can’t have enough diffusers in their house! Of course, the best thing to pair with a diffuser present is a few essential oils! Essential oils are a fantastic healthy gift idea because it’s easy to go through them quickly, and there are so many choices for special blends and purposes! Whether you’re buying essential oils for someone with anxiety, someone who wants to sleep more soundly, someone who needs to focus, or even your romantic partner, there’s something for everyone in the essential oil world! I don’t know anyone who couldn’t benefit from a calming essential oil roller. There’s also a wide variety of essential oil earrings to diffuse your favorite scents all day. You can also find some super-pretty essential oil bracelets that let you change out the cotton pads for different scents, as well as gemstone bead bracelets that use lava stone to hold the scent! If you’re looking for a gift for someone who already has a lot of essential oils, I love the book The Healing Power of Essential Oil by Dr. Eric Z. It’s got a ton of recipes for pretty everything you could think of making using essential oils! This book has 5 stars from over 500 reviews for a reason. These gifts are for healthy eaters, foodies, and organic food lovers. Or just anyone who wants to make healthy eating their new year’s resolution for 2019! If your foodie friend hasn’t jumped on the zoodle train yet, a spiralizer should be the first thing on your list! They can use it for sweet potatoes, zucchini noodles, beets, and much more! I’ve been using this spiralizer for years and I love it. If you’re gift hunting for someone who isn’t the DIY type, you can get them a big ol’ organic gift basket with lots of yummy and healthy snacks! Maca powder makes a great gift for almost anyone who’s healthy. If they’ve heard of it, they probably love it (it’s balancing and good for endurance, energy, fertility, and libido!) and if they haven’t heard of it they’ll enjoy learning about all the benefits. You can buy my favorite kind of Maca here or on Amazon. I prefer buying my Maca straight from The Maca Team because they have tons of options (use their Maca Finder to find the best one for you) they’re usually cheaper, it supports small business, and they ensure your raw Maca won’t be radiated during shipping! Herbs and spices are another fantastic healthy present- there’s a huge selection of bulk herbs and spices for every purpose (from culinary to healthy blends for colds, cramps, and more!) over at Southwest Botanicals. Speaking of herbs, there is one book I’d highly recommend for the herbalist in your life! Check out Healing Herbal Infusions: Simple and Effective Home Remedies for Colds, Muscle Pain, Upset Stomach, Stress, Skin Issues and More– It’s an awesome book with a bunch of easy herbal recipes that really work! If your loved one liked herbs and spices and you’re looking for something really special that they probably don’t have yet, you can get them a Chinese five-spice blend, pink pepper (how cool is that?? ), smoked sea salt, or Moruga Scorpion Chili Powder if you really want to spice things up. If you’re gift shopping for someone who likes making their own healthy food and drinks, why not get them a kombucha starter kit? It’s got everything you need to start making your own healthy, probiotic, gut-friendly kombucha! Or buy some maca, dandelion root, and roasted chicory root to make a delicious natural coffee substitute. One last kit for health food and DIY-lovers: you can’t go wrong with a sprouting jar kit! All of us have friends who adore tea. It’s a fantastic gift for healthy people! Starwest Botanicals has some great options for bulk tea. You can get yerba mate for caffeine-lovers, matcha tea because it’s all the rage right now, healthy and functional herbal tea blends for specific issues, yummy loose-leaf chai blends, or flowering tea for an extra-special present. To add to this gift, toss in a tea strainer or get a teapot kettle for making multiple cups of tea at a time! If they don’t have a coffee grinder you can also get organic ground coffee– I’m partial to this coffee brand. Their grounds make super strong coffee! But if you really want to get on their good side, include a burr grinder with their coffee so they can make a fresh-ground cup of coffee at home! If your coffee loving friend is trying to be healthier or reduce their caffeine intake, you can buy them some roasted chicory root, dandelion root, and maca root, so that they can make their own natural coffee substitute that tastes just as good as coffee! If the person on your list is trying to stay away from sugar, there are a lot of yummy flavors of stevia you can buy for a natural sweetener! My favorites are vanilla and English toffee. Of course, you can also buy them some maple syrup or delicious raw honey. I for one will always love receiving a jar of honey as a gift! Any of these sweeteners would pair perfectly with one of the tea or coffee gifts above! Reducing waste and pursuing a zero waste lifestyle is super important to some people. Here are some plastic-free gifts, sustainable gift ideas! Stainless steel straws or bamboo straws make a great gift to help replace single-use plastic. You can also buy net bags, cotton bags for produce, or tote bags– I love this set of zero waste bags. You can never have too many of these. It’s easy to stick them in your car, purse, or anywhere you want so that you never forget your bags at the store or farmers market! The zero wasters in your life would also love receiving a set of beeswax wraps as a sustainable, functional swap for plastic cling wrap. And if you’re like me and trying to reduce waste, you could always use more mason jars and stainless steel tins! Wooden gifts like this cutting board (it comes with a gift box and has amazing reviews!) or these eco-friendly spoons also make for fantastic sustainable gifts! If you want a nice wooden gift to use outside the bathroom, try buying them a set of biodegradable bamboo toothbrushes or a boar bristle dry brush for skin exfoliation! There’s also a really nice dry brush kit with a charcoal konjac sponge and other low-waste pampering tools! Need some more ideas? You can also check out this list of gifts for a minimalist or this list of 70 zero waste gift ideas! These are some ideas for health and fitness gifts for him. Whether you’re looking for a gift for your boyfriend, partner, brother, or dad, there’s something for everyone on this list! Some other healthy gifts for guys that are into fitness include a pull-up bar, raw organic protein powder, or a medicine ball. If you’re looking for non-toxic healthy personal products, Earthley has you covered! Try this fantastic beard oil, Magic Muscle Ease, or Nourish Him Naturally– a healthy herbal blend for men’s health. Let’s face it- most of the time, women are more into health than men. (That might be part of why we live longer… plus we’re smarter) 😉 If you’re clueless about what to buy the health-loving lady in your life, look no further than this list! Does your loved one enjoy yoga? You can get them a non-toxic, eco-friendly yoga mat (I love this one) or a yoga wheel. If they already have those things, why not get them a meditation pillow for their yoga space? They’d enjoy any of the essential oil products listed above, but essential oils like clary sage are especially good for women’s hormones and health. If you’re looking for a gift for someone who loves both health and makeup, they probably know that most conventional makeup is loaded with dangerous chemicals. Or they might not know that! Either way, get her some non-toxic and cruelty-free makeup from Orglamix– they have toxin-free eyeliner, mascara, lip and cheek tints, bronzer, and much more! Or if you’re the DIY type, check out this list of non-toxic makeup recipes! Make sure to include some reusable bamboo cotton pads for taking off the makeup too! Once again, Earthley has all you need for healthy personal products, from lotion to herbal extracts. For women, try their whipped body butter, Ease the Ache (a women’s cramp formula that really works!) or Nourish Her Naturally herbal blend. Earthley also has a great selection of healthy, all-natural gift options for women who are pregnant, post-partum, or nursing! I hope these healthy gift ideas help you in your gift hunt. Enjoy shopping for the health and wellness lover in your life! I know there are about a billion more ideas I could add, and new items coming out all the time… So I’ll definitely be sure to update this post regularly! Make sure you’re on my email list to stay up-to-date! 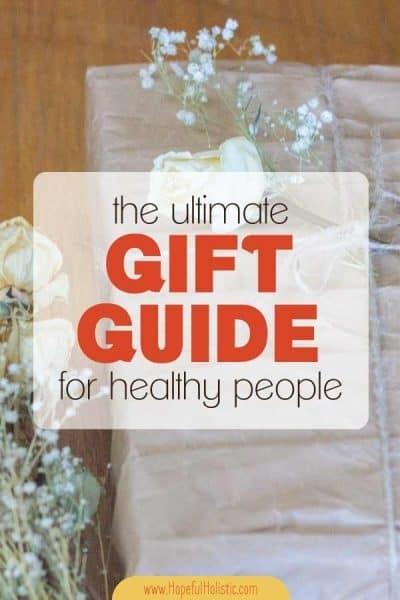 Do you have an idea that didn’t make it to the healthy gift guide? Share it below and add to the inspiration!